The Voice Nigeria is becoming one fo the most talked show in the country. On episode two of The Voice Nigeria – recorded another great show. It was full of suspense, emotions and drama while the contestants battled their way out to impress the judges. At first, the judges were not sure whether they loved his voice or the the way he sang the song but Patoranking was quick to press the button. Starting us off was a colourful reminder of how awesome and inspiring our coaches all are. Each coach got to share what they thought of the other coaches, and we got some other details. Next how the Blind Auditions work was explained, and according to the coaches, competition is tough, not just for the Talent but for them too. Like Timi puts it: “This is war!” Then a relook at the Talent from the first episode and which of them where in which team – #Team2baba and #TeamWaje both starting the show with 2 Talent each, while #TeamPatoranking and #TeamTimi kicking off with a Talent each. Episode two’s first talent was 24 -year old singer and choir girl, Khemmie from Kwara State. Singing since the age of 14, Khemmi says her father was her inspiration; when she would listen to him sing at church devotions. Her performance of Tiwa Savage’s “Olorun mi” immediately got Timi to hit the button in the first couple seconds followed by Waje not so long after. An overwhelmed Khemmie stood on stage as the coaches shared how much they loved her performance. Waje: “Khemmie your voice is like butter”, meanwhile Timi stood silently, taking it all before proceeding to make his pitch. After admitting to wanting Patoranking, Khemmie opts for #TeamWaje. Next up was 20-year-old rock star in training, Armstrong Martins. He reminisced about his father’s younger brother, who was his musical inspiration. Armstrong highlighted that he loved the fact that #TheVoiceNigeria targets real talent and then proceeded to mention that “Armstrong Martins” is his alter ego. His real name is Kelechi. Alter ego, Armstrong Martins took to the stage with his rendition, “Thinking Out Loud” by Ed Sheeran getting him a turn from Timi and instantly getting him on #TeamTimi. Meanwhile, the coaches couldn’t help but take notice of Armstrong Martins’s rock looks and Waje insisted on a kiss on a cheek from him – Patoranking didn’t seem to enjoy seeing someone else kiss his crush on the cheek. 51-year-old mother of three, Princess Pat from Edo State was up next to try and impress the coaches. A gospel/inspirational minister for almost 27 years, she believed it was time to get up and seize her moment on “ageless platform” of The Voice, before it’s too late. On stage, Princess Pat performed “Roar” by Katy Perry and while she did not get any turns from the coaches, they were all quickly moved by her courage and determination despite her age. They joined her on stage in respectful bow, showing their admiration. 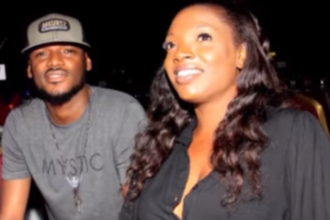 Even 2baba told the other coaches that they would need to look for her later, while Timi owes her a guitar! Next up is singer, dancer and actress, Linda 1Nneka from Lagos. Coming from a musical family, Linda loves for music began at a very young age. Now out to make her mother and niece proud of her, Linda 1Nneka takes the stage performing Asa’s “Be My Man” and gets Patoranking and 2baba to turn. After a stunned Linda 1Nneka gathers herself, she quickly flies into Patoranking arms in the biggest embrace of the show, so far! Not so long after she picks #TeamPatoranking to take her to the next round. In a quick diary session, Patoranking gushed over how getting Linda 1Nneka over his idol, 2baba was a huge moment for him. Following up after Linda 1Nneka is 20-year-old student, Daivy Jonez who is missing out on biochemistry classes to follow is father’s footsteps to becoming a musician – and he is pretty confident he is getting a turn from one of the coaches. A confident Daivy Jonez made his way to the stage to impress the coaches and ultimately make his father proud. With his rendition of Cee Lo Green’s “Forget You” he gets three coaches to turn for him, starting with 2baba. After some deliberation, he finally he picks #TeamTimi. 29-year-old mother of two, Mojisola arrived with her husband in hopes of making The Voice Nigeria her “coming out party”, the platform where she can begin to make her dreams of becoming a musician come true. Mojisola performance of Jill Scott’s “A Long Walk” gets Waje and Patoranking to turn for her. For a moment there, an excited Mojisola could not hold her obvious choice of wanting to join #TeamWaje, even before Patoranking could pitch. Up next was 28-year-old David who is no stranger to the stage. With a musical father, David’s love for music was sparked. A nervous David made his way to the stage to give it his all and boy did he, with his rendition of One Direction’s “Story of my Life”, moving 2baba to turn for him – putting him in #Team2baba automatically. 32-year-old special effects make-up artist, Feyishayo was up next. With the support of her mother who she shares thought it was about time for Feyishayo to go for her dream of being a singer like her folks. But unfortunately her performance of Darey’s “Pray For Me” did not get any of the coaches to turn. The coaches felt she played it safe. Thankfully, Feyishayo was more inspired than disappointed by her outcome. The next talent out to impress the coaches was Prime, a 23-year-old trader from Lagos. Despite growing up in a broken home, Prime’s fire for music growing bigger but was held back as he needed to make money to take care of his mother. Taking a step toward his dream of one day winning the Grammys, Prime took to the stage with his rendition of Lorde’s “Royals” and got 3 coaches (Patoranking, Timi and 2baba) to turn. Without even letting any coach make their pitch, he chose #TeamPatoranking. And the final talent of the night was 22-year-old professional singer, David Operah who came to the Blind Auditions with his manager, who he obviously respected and appreciated. David Operah headed to the stage, ready to be moved by the experience of it all, but as it turned out, he moved the coaches with his rendition of Rihanna’s “Stay” giving him the first and only 4-turns of the night! 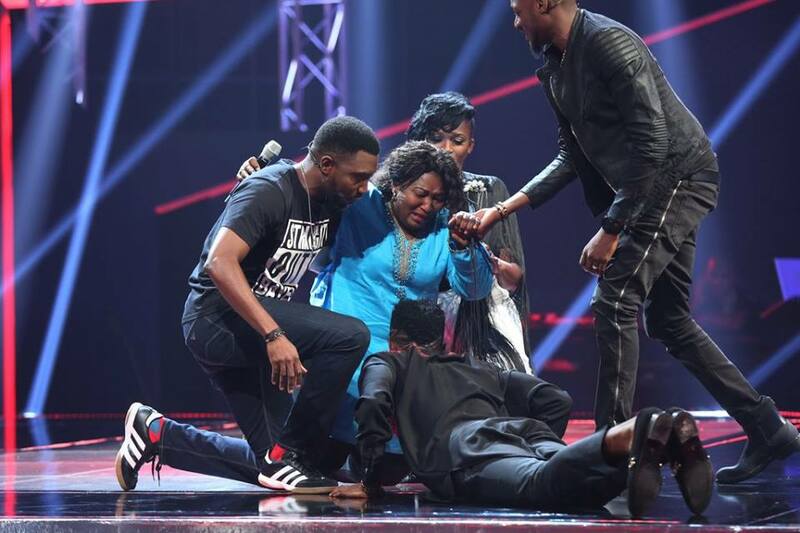 Waje admits to crying, although the other coaches didn’t buy any of it. But despite his initial plan to go for #TeamTimi, he quickly had a change of heart and went for #Team2baba. This now leaves #TeamWaje with four talent, #Team2baba with four, #TeamTimi with three and #TeamPatoranking also with three. Re-watch moments from episode 2’s Blind Audition HERE. And don’t forget to tune in next Sunday at 19:00 WAT to see the teams grow bigger – and for more surprises and drama as #TheVoiceNigeria continue! The Voice Nigeria airs at 7pm WAT on AfricaMagic Showcase DStv Channel 151 and on AfricaMagic Urban DStv Channel 153.